SPA TREATMENT- The 24K Gold Collagen Face Mask is a spa quality treatment that deeply penetrates in the skin to help restore skin elasticity, moisturize, smooth wrinkles, tighten complexion, rejuvenate, and brighten skin tone. ANCIENT BEAUTY SECRET- The ancient Egyptians, one of the greatest civilizations in history, believed in the healing powers of gold. Legend has it that even Pharaoh Cleopatra benefited from the powers of gold therapy! INCREASED CELLS REGENERATION- Containing gold and antioxidant properties, the 24K Gold Collagen Face Mask helps your skin get rid of free radicals; which are the cause of several skin problems, such as cell metabolism disorder, long acne, and aging. INCREASED ELASTICITY- Gold can also activate the basal cells of the skin, which increases the elasticity of the skin; reducing wrinkles, fine lines, blemishes, and making your skin look younger. 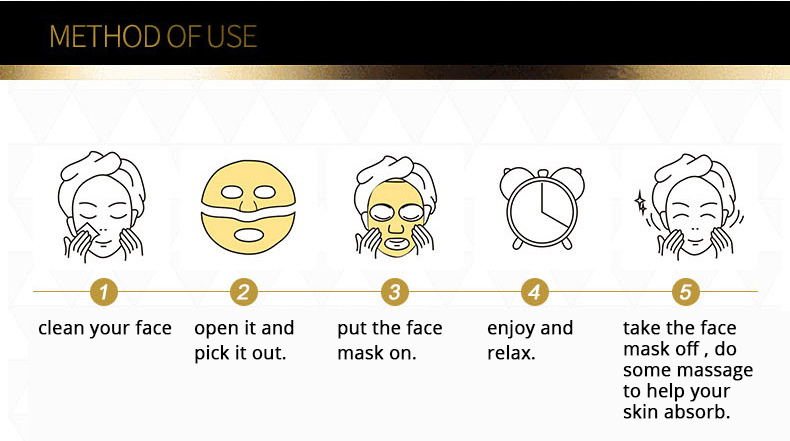 HOW OFTEN TO USE?- For better results use the 24K Gold Collagen Face Mask 1-3 times a month. ADD THE LUXURY TO YOUR CART NOW!